With its alpine peaks, primal forests, pristine lakes and vast steppe, it’s no understatement to say that Kyrgyzstan is one of the most beautiful countries in the world, yet it remains refreshingly undiscovered. Spanning two weeks, this small group tour of Kyrgyzstan departing from the capital, Bishkek, aims to show you exactly what you’ve been missing. You’ll cross dramatic mountain passes to reach the stunning Sary Chelek Nature Reserve, a UNESCO-protected biosphere where you’ll walk between two of its six turquoise lakes amid beautiful vistas. Head south, then, to Arslanbob. This famously picturesque Uzbek village near an ancient walnut forest that was a favourite of Alexander the Great, and is now the world’s largest source of walnuts. 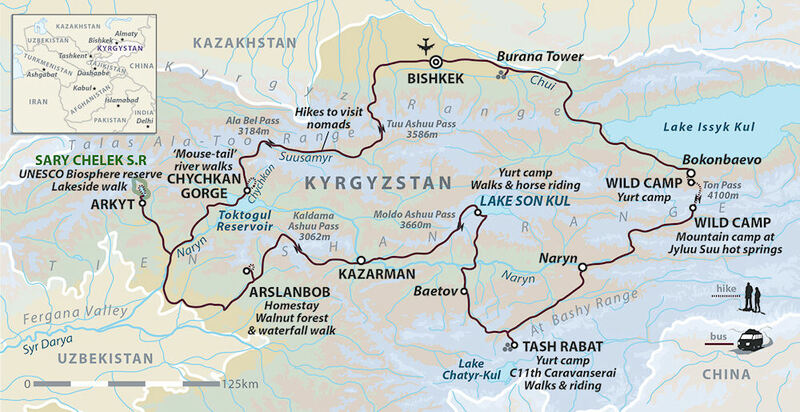 From Arslanbob you’ll travel through the interior of Kyrgyzstan, over mountains to a spectacular lake, Son Kul, and a night spent in a yurt at a shepherds’ camp. An idyllic location, the lake is surrounded by fantastic hiking terrain which you can enjoy before moving on to Tash Rabat, an ancient Silk Road caravanserai, and then another yurt camp, this time by some refreshing hot springs. Before returning to Bishkek, one of the most memorable days of the tour begins with a display of traditional eagle hunting, then a marvellous hike through the foothills of Tien Shan to Bokenbaevo. This Kyrgyzstan tour is packed with cultural immersion, exhilarating trekking and above all scenery that will make your rub your eyes in disbelief. In Central Asia we have developed unique relationships with many of the semi-nomadic peoples of the region and through our form of interactive, socially conscience tourism have helped them adapt to the modern, changing world by providing important income opportunities. With the eagle hunters on the shores of Lake Issyk Kul, or Noorgul, a shepherdess from the pristine Son Kul, or Nazira and her family at Tash Rabat, we have been responsible for introducing them to the homestay market, helping them to provide good, clean and interesting accommodation which in term allows them to educate their children, improve their standard of living and look after their ill. The wonderful thing about this kind of interactive tourism is that everyone gains – the nomads financially and us with the wonderful welcome and experience they give us. On this trip, we work exclusively with the fine horse-man Anar Bek, who along with his family and members of the local community, ensure that the horses we trek with are well treated, well fed and well looked after. Wherever possible we stay in locally owned accommodation, eat in locally owned establishments and purchase supplies from the local nomads.